I wish you and all friends of Solargraphy will enjoy a great Xmas and a colorful New Year and night! I want to thank You and all my can assistants for your extraordinary fine collaboration with me in this global pinhole art project. 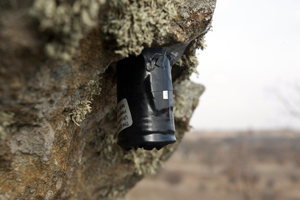 I am so glad that so many new pinhole cans are exposing for the next 6 months around the world. There is something similar views with mountains and the sea in these two solargraphs although the first solargraph comes from New Zealand and the second one from Skibotn, Norway, on the other side of the world. I have used to interpret the Sun´s path in the solargraphs in the northern hemisphere as follows: The Sun´s altitude is reached in midsummer on June 21, 2008 and its long path does not go under the horizon at all by night. The missing traces between the white lines are due to the Sun being obscured on overcast days. How to interpret the Sun´s paths in the southern hemisphere? The exposure was almost similar in these images. In the opposite part of the world there was winter in New Zealand and summer in the North Norway. So the Sun was at the lowest in New Zealand when the Sun´s peak was in midsummer in the northern hemisphere. A funny story happened in Kongsberg, Norway. At the autumnal equinox (Sept 22, 2008; 11:44:18 A.M. EDT), the Sun appears to cross the celestial equator, from north to south; this marks the beginning of autumn in the Northern Hemisphere. It's one of two times a year when the Sun crosses the equator, and the day and night are of approximately equal length. It is a good day to replace a new can for exposing for three months until the winter solstice. If you wish to have the expsoure of 6 months and you have started exposure from June to December you can leave your pinhole can alone until December. 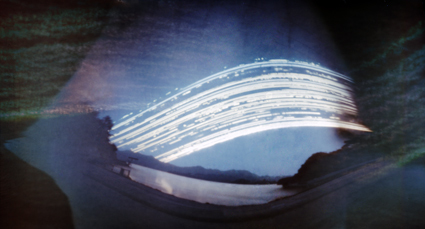 This solargraph is a delight to the eye. Tom Miller sent me back my cans from Mississippi for proceeding and this was the best of them. I wonder the yellow colour in the sun´s paths. I would appreciate very much if somebody could find a good explanation for it. In the northern hemisphere the sun does not go under the horizon at all. Here you see my photograph “Night Sun” taken at midnight on my way to Kilpisjärvi on 30th May.Kilpisjärvi is the coldest place in Finland. The lake Kilpisjärvi was still in ice. 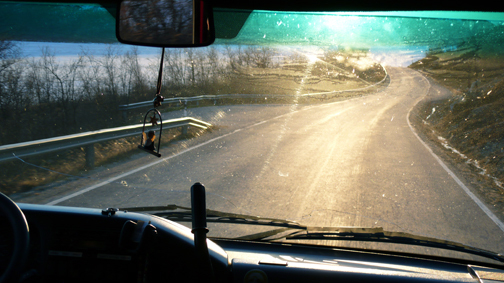 What is an immaterial photograph like? Here you see one of my photographs taken in Poland in May 2008. The title of the image is `cosmos´. I tried to catch my experience into the image. 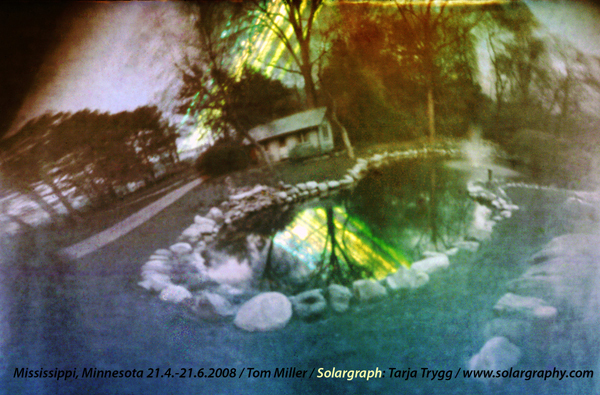 I cannot yet stop the project because more experiences and information on solargraphy appear all time. What has happened in the project in 2007 can be read. But now you can follow also What´s Up in every month. The newest is the interactive level on this site. It is possible to comment directly here and all participants can take part in the conversation and bring all arguments, too. An interactive page has been added to this website. Earlier I have discussed and answered to the questions by email. Now it is possible to follow and take part in the conversation in public, too, here on the website. Some phenomena in solargarphs pay attention and curiosity. Your comments and arguments are very welcome. The exhibition Topek@ was the memorial exhibition for Rob Mast and it was held 18.1. - 2.2.2008 in Haarlem, NL. Malin Fabbri, editor of Alternative Photography.com - a website dedicated to alternative photographic processes. So many historicalphotographic methods are in use today and Malin asked me to write an article about solagraphy with few examples of the images. She has also a newsletter that goes out to 3000people. The article was published in the April newsletter on AlternativePhotography.com.